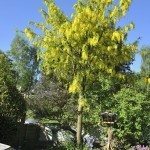 There are over 30 species of Cytisus, or broom plants, found in Europe, Asia and northern Africa. One of the more common, sweet broom (Cytisus racemosus syn. Genista racemosa) is a familiar sight along highways and in disturbed areas of the west. While many people consider the plant a noxious weed, it is an attractive plant with its pea-like golden yellow blooms and bright green compound leaves. The plant grows quickly and produces a nice airy bush with drought and cold tolerance. In the proper space, growing sweet broom shrub will add a nice wild touch to the landscape and enhance the area with its scented blossoms. A common bit of sweet broom info is its relation to the pea family or Fabaceae. This is evident in its bloom form and also means the plant has the capacity to fix nitrogen in soil. The plant was popular for its rapid growth and low sweet broom shrub care. 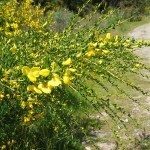 But is sweet broom invasive? It was used by the United States transportation department to colonize disturbed roadsides after building trans-continental roads and to enhance soil properties but is now considered invasive in some regions. If the plant can become invasive, why then would you want to know how to plant broom shrubs? Besides sweet broom’s nitrogen fixing abilities and its rapid growth with fibrous soil stabilizing roots, the sweet smelling, attractive blooms are a harbinger of summer. Across many of the nation’s highways it blazes with color and attracts pollinators of many species. With careful management, sweet broom can be a wonderful addition to the landscape. The plant forms a shrub 6 to 8 feet wide with a slightly smaller spread. If established in well-drained soil, the plant’s needs are met with low fertility additions and moisture. Pruning broom shrubs is optional but can help to keep it in the habit you wish. This low maintenance plant may be just the thing for an easy care garden. Select a bed where the soil has been worked deeply and is freely draining. These plants tolerate a range of unpleasant conditions such as windy sites, low fertility and even rocky areas. Dig a hole twice as deep and wide as the root ball. Push the soil around the roots and tamp it down. Water your sweet broom regularly for the first few months if rainfall isn’t sufficient to keep the soil moist. Broom shrubs don’t need supplemental food in most situations but add iron sulfate in spring where soils are alkaline. Try growing sweet broom shrubs in groups as a hedge or border with brilliant yellow flowers and stems of wild abandon. Once the flowers are spent and seed heads have formed, pruning broom shrubs is recommended to reduce seed spread. Just a light deadheading will do the job. Other trimming is up to you but not strictly necessary. 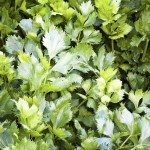 Trim the plant in late fall, late winter or before flower buds have formed if you want to keep the size down without diminishing blooms. The biggest pest issue is webworms. These pests overwinter in old debris, so keep the area under the plant raked clean. Use organic mulch to prevent weed competitors and conserve moisture. 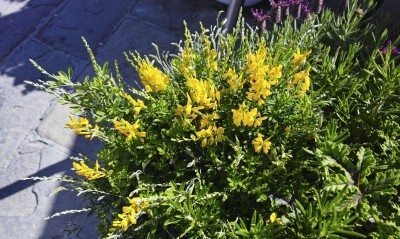 The broom family is a hardy, no fuss group that is much maligned but can perform well in the cultivated garden with little care.